Last month, we had the great privilege to honor our city's safest professional drivers and bases, as well as to recognize drivers for achievements in accessibility and customer service. Between January 2016 and July 2018, our Honor Roll drivers completed a staggering 4.7 million trips, taking the riding public safely to their destinations. That is the equivalent of 49 round trips to the moon which is 239,000 miles away. This is almost two-thirds of the way to Mars at its closest point which is almost 34 million miles from Earth. 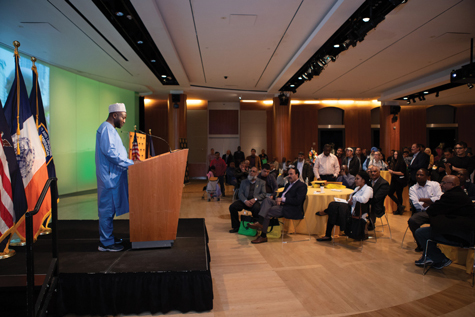 Wheelchair accessible taxi driver Ali Abubakar, a repeat honoree who spoke at the ceremony, shared his story. A father of six and a widower who lives in the Bronx, his family has undergone significant tragedy. He inspires many with his supreme patience on the road which he credits for making him a safe driver, and his positive outlook. "When you are patient, you can accept delays or frustrations without feeling upset or getting angry," he said. "You have a sense of calm and peace that allows you to focus on the task at hand without getting annoyed. If you are patient, you will achieve whatever you want. With patience, you will beat everything." 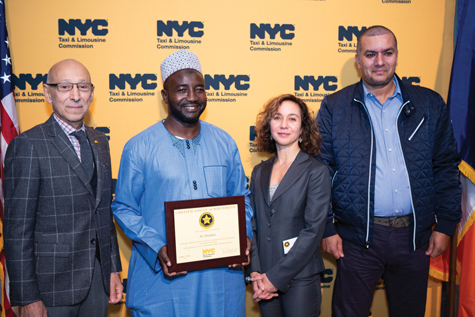 Another accessible taxi driver, Hazzem El-Sisi, was recognized for completing more than a hundred Accessible Dispatch trips. "Part of the reason that I like to do trips with Accessible Dispatch is because I have Erb's Palsy, a birth injury," he said. "Living with Erb's Palsy has given me some perspective on what it is like to be a New Yorker with a disability, and it makes me feel good to help passengers travel to where they need to go. It feels good to help people in anyway." Victor Chiofolo, who manages the taxi fleet Ann Service in Chelsea which dates back to the 1920s, also spoke about how important Vision Zero is to their company. Self insured, the fleet gives drivers between two and six shifts for free if they avoid a crash for six months. Thierno Diakhate, a taxi driver who helped the NYPD arrest a suspected bank robber, was also recognized with a mayoral proclamation. "You're really the backbone of the city," Gale Brewer, Manhattan borough president told the drivers. "You see. You hear. You're also the eyes and ears of our streets." Victor Chiofo, Ali Abubakar, Commissioner Joshi, and Hazzem el-Sisi take a group photo. Wheelchair accessible taxi driver Ali Abubakar talks with drivers and bases at the Vision Zero Safety Honor Roll. Commissioner Joshi gives a plaque to Ann Service Corporation manager Victor Chiofolo. Hazzem El-Sisi speaks to drivers and bases at the Vision Zero Safety Honor Roll. As daylight savings time ends on early Sunday, November 4, all drivers need to be extra cautious about the potential for crashes when it is harder to see. Fatal crashes with pedestrians typically go up 50% from September through January each year in New York City. Evenings will get darker more quickly, and pedestrians are hurt more in dusk crashes than at any other time. Our vision drops tenfold as night falls, and depth perception, color vision, and peripheral vision all suffer. Pedestrians, particularly children, may also not realize how dark it is at 5 p.m. and how little visibility there is for drivers. Each year, traffic crashes cause more than 200 deaths citywide, and seriously injure 4,000 people. TLC-licensed drivers, who spend many hours on the road, can make a huge difference to make that a distant memory, and we appreciate your vigilance and care on the road. 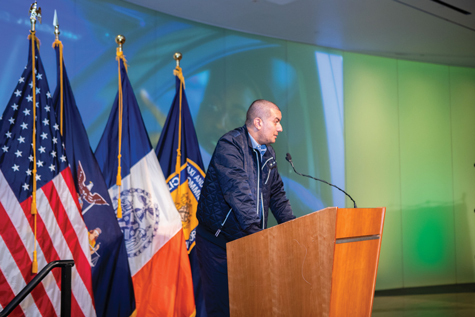 In October, the TLC also held a hearing on proposed policies to protect for-hire vehicle drivers so that they have the pay and expense transparency that yellow taxi drivers have. This includes leases written in plain language that specify all costs to drivers and receipts that itemize all payments, deductions, and charges. The rules also expand pay protections for taxi drivers by reducing the maximum credit card surcharge fleets can charge from $11 to $7, which can save a full time driver more than $1,000 per year. We also proposed greater payments to drivers for Accessible Dispatch, and expanded financial restitution when drivers are overcharged on security deposits. The TLC heard testimony from over 25 drivers, as well as other stakeholders on a wide range of pay issues. Earlier this year, labor economists from the New School and University of California, Berkeley, conducted an unprecedented analysis of for-hire vehicle driver income. They found that 85% of drivers earn less than the equivalent of the minimum wage. The proposal made at the hearing was to establish a minimum pay requirement which is estimated to raise driver pay by 22%. We greatly appreciate the time that drivers and other licensees took from working to share their compelling stories with us, and we are thoroughly considering all the testimony we heard. 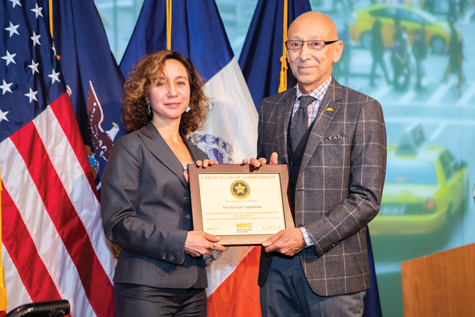 protecting the livelihoods of drivers and other businesses who participate in the NYC Taxi/Car Service industry by acquiring a TLC license or by supporting those who do. I am sad to report that with increasing frequency, our officers face violence and harassment while they perform their jobs honorably. In the first week of October, two of our officers tried to stop an unlicensed commuter van on Flatbush Avenue that was full of passengers. The driver rammed the van twice into a TLC patrol vehicle causing extensive damage and sending a TLC officer to the hospital. The work of the TLC's officers is critical to achieving Vision Zero, the city's plan to end traffic deaths. As well, they make sure that unlicensed drivers don't poach trips that our licensees need to provide for their families. We are deeply appreciative of the sacrifices that New York's Proudest make, and the excellence they show in the work they do. Until next time, please join the 410 exemplary Safety Honor Roll drivers we honored this year and drive like your family lives here!